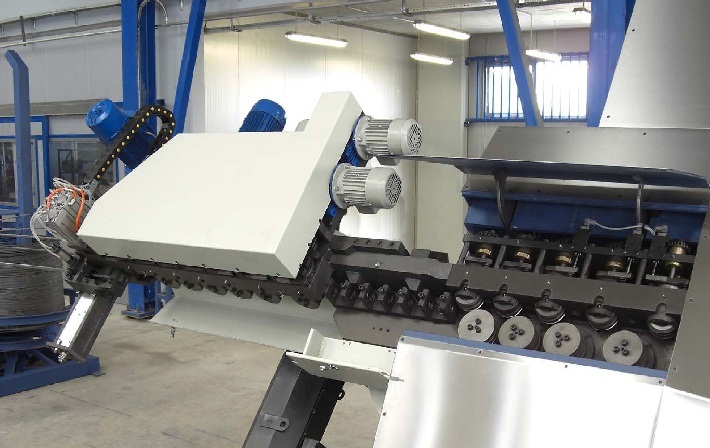 With more than 20 years of experience in the construction of CNC machinery, EUROBEND GmbH offers a wide range of equipment, such as two & three dimensional rebar benders, single line and multi-line straightening and cutting machines, wire/rebar mesh welders, continuous stirrup and spiral reinforcement machines, etc. Our reputation is based on customer satisfaction and our commitment to reliable and technically advanced machinery is reflected in the quality of every piece of equipment that leaves our production lines. High-quality of components and final product, competitive prices, along with significant after-sales service are major assets. Exports comprise 98% of the companys turnover and contribute to its dynamic growth. This success is due to the combination of quality and flexibility the machines ensure, compared to those existing in its market segment. The development of innovative and unique products and technical expertise is a continuous process and part of EUROBEND GmbH long-term strategy and consequently have assisted in establishing EUROBEND GmbH as a leading brand name in the international arena. Our unique advantages -reliability and cutting edge technology- are exquisitely combined with highly responsive after service support, making our equipment the obvious choice for the small, mid-size and large re-bar fabricators. 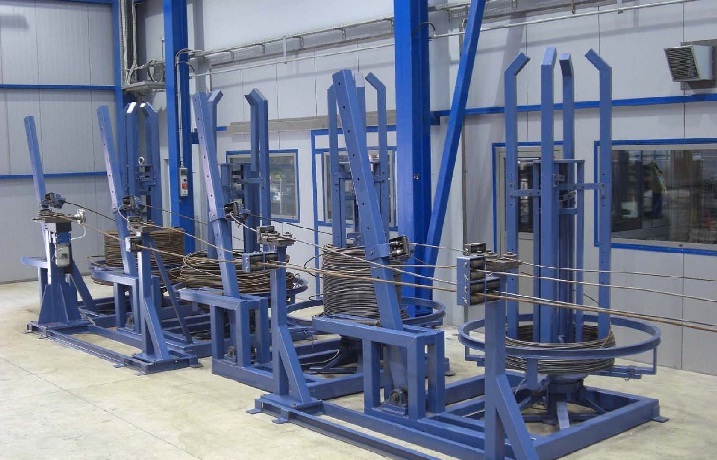 Among our rebar processing equipment lines, a complete range of high-speed programmable servo-driven rebar benders for coiled re-bar is offered (type G-STAR), designed for heavy duty continuous operation within the reinforcing industry. For operations processing rebar from straight stock, the G-STAR 20 SB is available, processing up to 20mm re-bar (single feed) or up to 16mm (double feed). Every G-STAR bending machine is equipped with a sophisticated bending system, which employs a retractable bending pin, located on the rotating plate enabling re-bar feeding during bender back motion, thus increasing the production capacity and minimizing the moving bending parts. Furthermore, due to smart bending head design and the location of the cutting tool -in relation to the bending tool- cutting is achieved without re-bar(s) reversing. 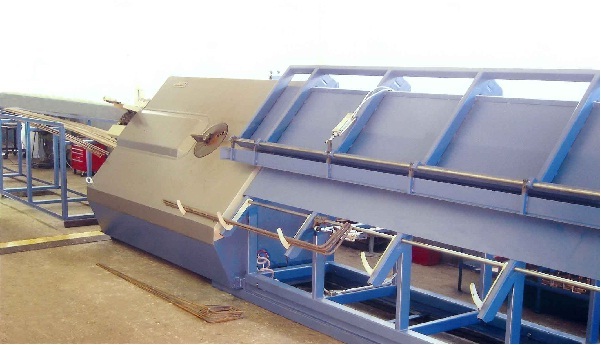 The straightening system found on the G-STAR range of rebar benders has two straightening devices and uses a number of unique features, which ensure excellent straightening and smooth re-bar feeding. The two straightening devices are placed at 90° to each other and they have multifunctional characteristics, as every set (upper and lower) of straightening rollers perform a number of crucial operations. Looking deeper into the straightening operation, a powerfull geared servomotor is responsible for transmitting power to every lower straightening roller. 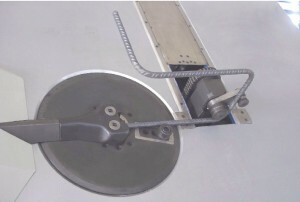 With this technique, the straightening force is evenly distributed along the full contact line between the re-bar and the rollers, thus achieving smooth feeding without imposing excessive force, which marks and damages the re-bar. In addition to the power transmission functionality of the lower rollers, the upper rollers of both straightening systems have the ability to rotate on their vertical axis in proportion to the re-bar direction, thus compensating for any twist or internal stresses found on the processed re-bar. The mechanics behind this feature are rather simple: Depending on the direction of the axial twist of the rebar, a centrally adjusting mechanism imposes an opposite angle to the lower roller, thus eliminating any tension and /or twist and ensuring the production of flat stirrups. 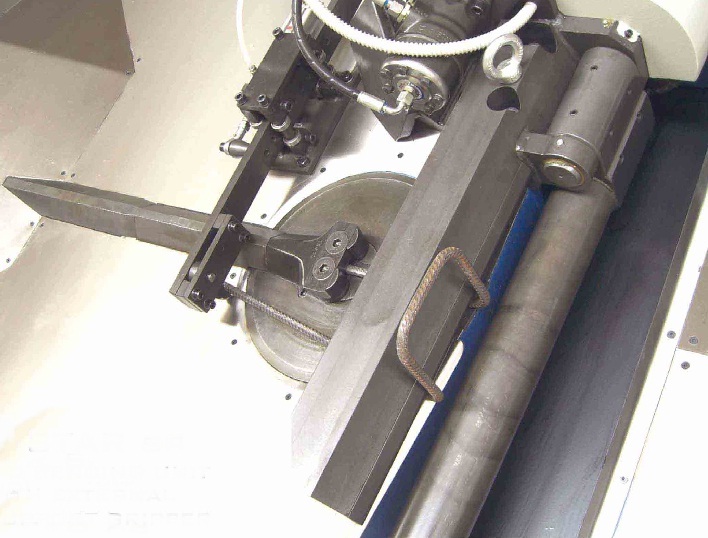 Concluding on the straightening system, all G-STAR benders are equipped with a fast an accurate diameter changeover device, (Hexagon Shaft Pre-setting System), where all rollers are adjusted at once using the preset markings, for every processed diameter. For advanced operation a motorized automatically adjusting system is optionally available. Heading towards the bending head after the straightening devices, an additional anti-twist mechanism is available. This is the latest addition to the list of advanced -patented- features found on the G-STAR range and it is known as the Automatic Torsion Eliminator (ATE). A set of pneumatically activated moving grippers, prevent the re-bar from twisting while feeding and bending. However, the most well-known feature of the G-STAR benders is the 3-D bending capability. Optionally available on any G-STAR model an additional bending system can produce three-dimensional bends, eliminating the need of secondary bending operations and giving realistically unlimited shape possibilities. SP VERSION with double folding arms and external 3-D support unit for increased productivity (patent). This 3-D bending type is recommended for high output production of Continuity Systems stirrups. EUROBEND GmbH successfully combines all the above unique features with user-friendly and reliable software, making every G-STAR bender easily controlled and operated without requiring any programming skills. The main operating software has also a self-diagnostic feature checking all operations of the bender and preventing breakdowns. Furthermore, due to the hardware installed, it is possible to connect the computer of the bender over the internet and run maintenance checks and trouble-shooting from our service centers in real time mode. Powered pay off stations: With capacity of 3tn and 5tn equipped with tension detector and a geared three-phase motor, for smooth de-coiling and re-bar feeding. Tilting pay off stations: In places with height limitations and/or restrictions, the hydraulically operated pay off station allows the loading of each coil horizontally, close to the ground level. 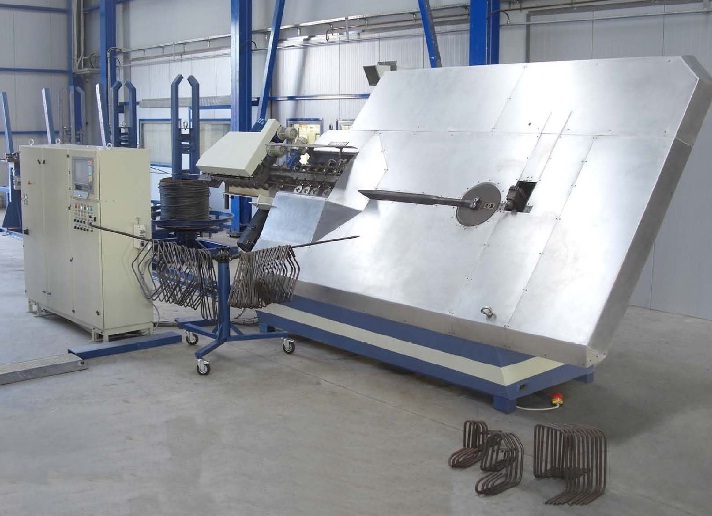 Powered pre-straightening units: Bringing the beginning of each coil from the pay off station to the G-STAR bender, it can be difficult, time and labor consuming especially when processing re-bar with diameters above 12mm. The powered pre-straightening unit acts as an intermediate device between the pay off station and the bender and feeds effortlessly -through a set of powered straightening and feeding rollers- the beginning of the coil directly to the machine. Regardless of how far the pay off station is located in relation to the machine, this unit makes the loading of the re-bar a matter of seconds. Product identification stamping: Special cutting tool that puts a combination of letters and numbers on every part/stirrup produced. Helical/Ring forming attachment: Add-on forming device for the production of circular stirrups and ring spirals. This device practically transforms the G-STAR bender to a ring spiral machine. Straight bar collection station: The straightening quality achieved and the flexibility of the bender, allows the use of the G-STAR as a straightening and cutting machine processing either one or two re-bars simultaneously, depending on the capabilities of the model. The collector (available in lengths of 3m, 6m and 9m) provides excellent storage for straight bars or bars with one-side bends. Bending table Inclination mechanism: When producing oversized stirrups, this hydraulically operated mechanism tilts the bending table of the machine, providing the required extra space and support. Titling is possible during machine operation.